The Interstate highways in the state are I-95 (the Connecticut Turnpike) running southwest to northeast along the coast, I-84 running southwest to northeast in the center of the state, I-91 running north to south in the center of the state, and I-395 running north to south near the eastern border of the state. The other major highways in Connecticut are the Merritt Parkway and Wilbur Cross Parkway, which together form State Route 15, running from the Hutchinson River Parkway in New York State parallel to I-95 before turning north of New Haven and running parallel to I-91, finally becoming a surface road in Berlin, Connecticut. Route 15 and I-95 were originally toll roads; they relied on a system of toll plazas at which all traffic stopped and paid fixed tolls. A series of terrible crashes at these plazas eventually contributed to the decision to remove the tolls in 1988. Other major arteries in the state include U.S. Route 7 in the west running parallel to the NY border, State Route 8 farther east near the industrial city of Waterbury and running north-south along the Naugatuck River Valley nearly parallel with U.S. 7, and State Route 9 in the east. Connecticut also has a very active bicycling community, with one of the highest rates of bicycling ownership and use in the United States. New Haven’s cycling community, organized in a local advocacy group called ElmCityCycling, is particularly active. According to the U.S. Census 2006 American Community Survey, New Haven has the highest percentage of commuters who bicycle to work of any major metropolitan center on the East Coast. Southwestern Connecticut is served by MTA’s Metro-North Railroad New Haven Line, providing commuter service to New York City and New Haven, with branches servicing New Canaan, Danbury, and Waterbury. Connecticut lies along Amtrak’s Northeast Corridor which features frequent Northeast Regional and Acela Express service. Towns between New Haven and New London are also served by the Shore Line East commuter line. Operation of commuter trains from New Haven to Springfield on Amtrak’s New Haven-Springfield Line is under consideration. Amtrak also operates a shuttle service between New Haven and Springfield, Massachusetts, servicing Hartford and other towns on the corridor. Bradley International Airport is located in Windsor Locks, 15 miles (24 km) north of Hartford. Regional air service is provided at Tweed New Haven Regional Airport. Larger civil airports include Danbury Municipal Airport and Waterbury-Oxford Airport in western Connecticut. Sikorsky Memorial Airport is located in Stratford and mostly services cargo, helicopter and private aviation. The Westchester County Airport in Harrison, New York serves much of southwestern Connecticut. 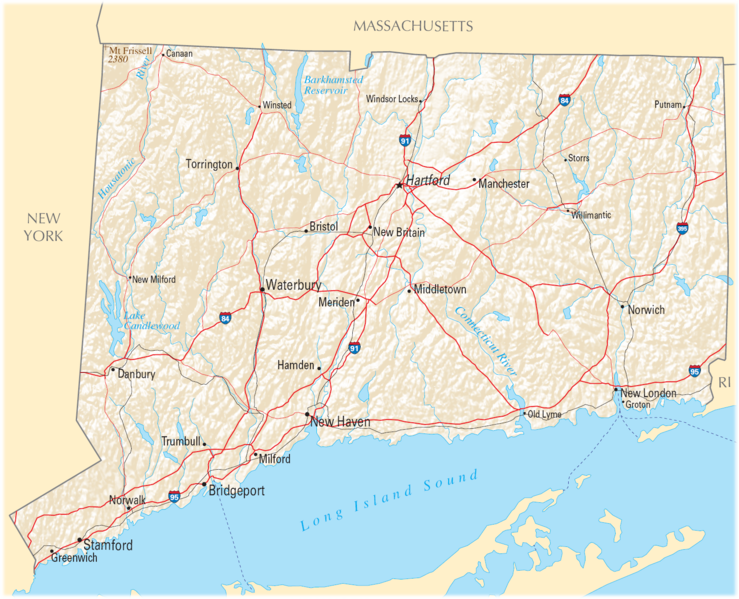 Map of Connecticut showing major highways.